Watch over a dozen species jockey for the feeders on the 2018 West Texas Hummingbird cam. 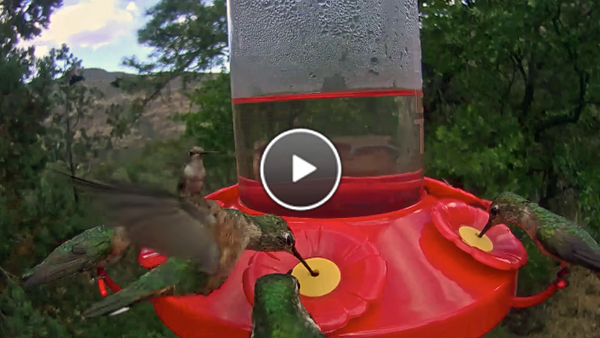 The West Texas hummingbird cam sponsored by Perky-Pet is back just as spring migration is hitting full stride! Over the cam season, viewers will have the chance to witness over a dozen different hummingbird species as they migrate through the arid Davis Mountains in West Texas (watch a highlight featuring all the species that visited the cam in 2017). You’re sure to be dazzled by these bejeweled fliers as they hover from port to port, sipping nectar from one of the 24 Perky-Pet Grand Master hummingbird feeders hosted at the cam site by our parters at West Texas Avian Research. Watch cam. What To Watch For: Rivoli’s, Black-chinned, and Broad-tailed Hummingbirds are the usual suspects on cam this time of year. However, there have been reports of less-common Lucifer and Broad-billed Hummingbirds frequenting the feeder. The latter has also been seen gathering nesting material (See photo of female collecting unbleached cotton fiber that’s offered on site). 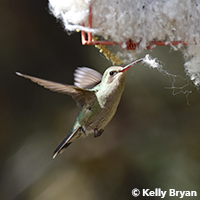 As the weeks pass, other species, like the pugnacious Rufous or pint-sized Calliope Hummingbird, will steal your breath away, meaning there’s no better time to get out that species guide and start learning these hummingbirds! Help us win a “People’s Choice” award for our three-minute video about an upcoming Bird Cams project! Click to watch and submit your vote. Please share with family and friends, too! 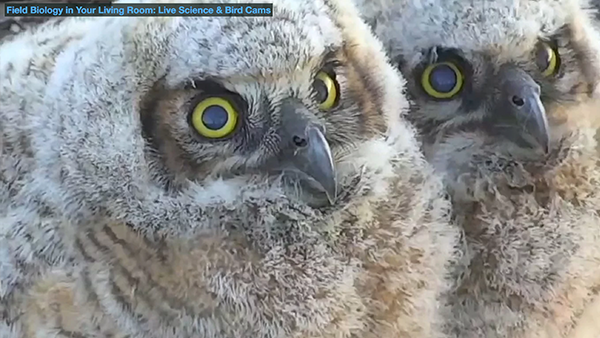 Thanks to support from the National Science Foundation, the Bird Cams team is designing a new project to bring together cam viewers and scientists in research projects involving the cams. An introductory video about the project is now being featured in the 2018 STEM for All Video Showcase, and it’s up for a “People’s Choice” award! We hope you’ll enjoy our video and others in the showcase, and cast your votes to show your support for these exciting projects. Vote now.